I made way to much rice the other day, so I bought a bunch of veggies to cook up with the leftover rice to make a great new meal. I love making a big meal and then having leftovers for lunch for a few days, and this works perfectly for that. It’s easy to make, and the only part that takes a bit of time is letting the onions brown, which is key to the flavour in this dish. I took this picture before adding the kale; it’s really good without kale too, but I added it because it’s so good for you. 1. Slice the onion into strips that are just less than 1cm wide. In a large frying pan, heat the oil on medium high, then add the onions and cook them until they are slightly browned. 3. Cut peppers into strips similar in size to the onions. Add to the onions, along with the sliced garlic and leeks, and cook for a few minutes. 4. Grate the carrot and add to the other veggies. Cook for 5-10 minutes, until the peppers are soft and the onions are quite brown. 5. 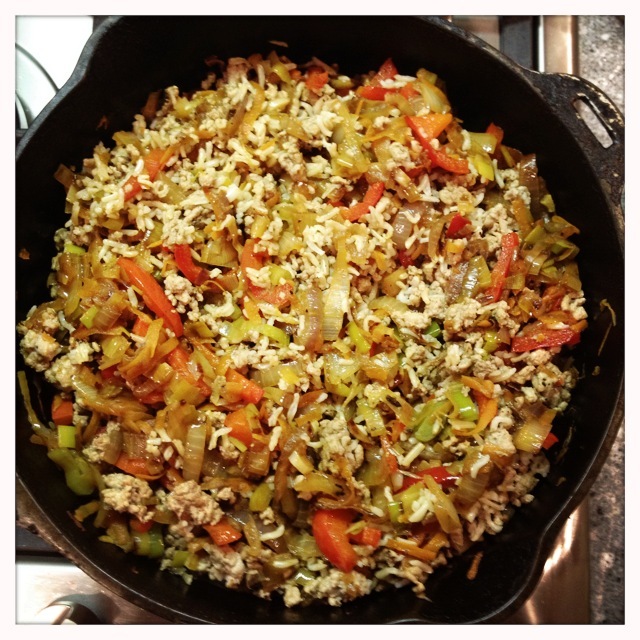 Place the veggies in a bowl, then cook the ground turkey until it’s not pink any more. 6. Add some olive oil to the pan, then add the cooked rice to the turkey and stir, scraping the bottom of the pan, for several minutes. Now add the veggies, the chopped kale and some soy sauce to taste, and cook for a few minutes. Season with lots of pepper.